Back in the city’s early heady and hopeful post-handover days, when Anson Chan Fang On-sang spoke, people listened. 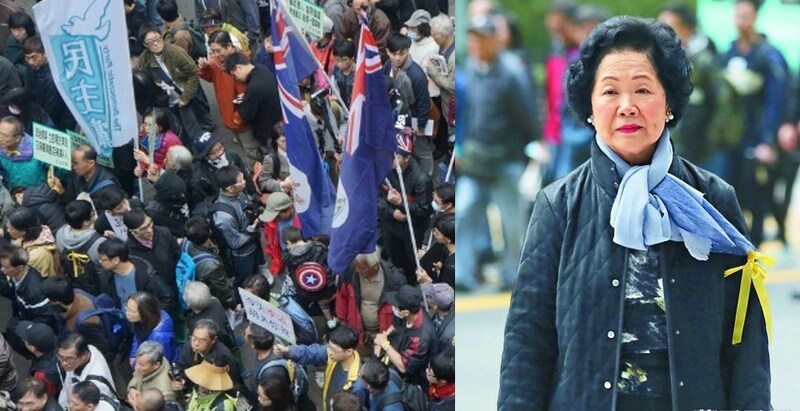 Then serving as chief secretary, she came to represent the core values—free speech, clean government, democratic development and the rule of law—on which the city should never compromise under the “one country, two systems” arrangement with the mainland. 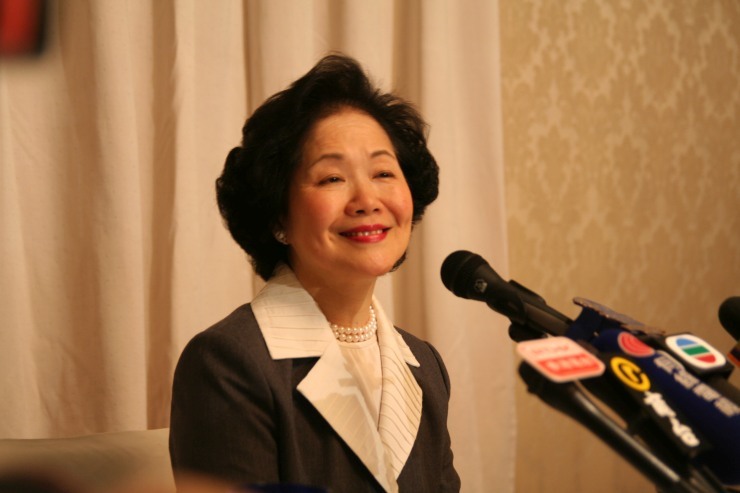 When her boss, Chief Executive Tung Chee-hwa, showed clear signs of hedging on those values, the two clashed and Chan would then resign in 2001, citing “personal reasons,” well before the end of her term. But she would continue to speak out for those core values and become one of the city’s leading figures in its painful quest for greater democracy. 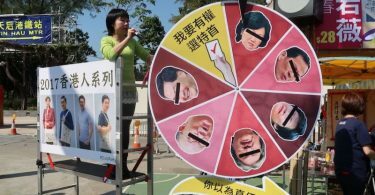 It was Chan who came out of retirement in 2007 to throttle the comeback dreams of Regina Ip Lau Suk-yee, the once-despised secretary of security who had failed in her strident efforts to ram anti-subversion legislation down the throats of the Hong Kong people. In a Legislative Council by-election widely perceived as a battle for Hong Kong’s soul, Chan won decisively over Ip, and it seemed the forces of light had prevailed. But now look at our city. The ever-resilient lp finally managed to win a LegCo seat and, over the past eight years, her hard work and dogged commitment have made her one of the council’s most popular lawmakers. She has also been appointed to the Executive Council and is now a chief executive candidate. Meanwhile, Chan, now 77, has been reduced to a voice in the wilderness—that same wilderness occupied by Martin Lee Chu-ming and other formerly iconic but now ageing Hong Kong pro-democracy leaders—bordering on irrelevant to the rough-and-tumble of the city’s current political battles. With the launch in 2013 of her think tank, Hong Kong 2020, Chan tried to remain in the mix of Hong Kong affairs. But today’s younger generation, even if they recognise who she is, regard her as a relic of the past, and the Beijing-fearing media blast every effort she makes to uphold free speech and advance the cause of democracy. Chan has long stood squarely in the firing line of Beijing mouthpieces such as Ta Kung Pao and Wen Wei Po, but you know times have changed when columnists in the city’s leading English-language publication, the South China Morning Post, now owned by Chinese Internet giant Alibaba, start unloading on a public figure who not so long ago was hailed in its pages as one of the most able and trustworthy officials in the Hong Kong government. Lo and Chugani’s column. Photo: SCMP screenshots. 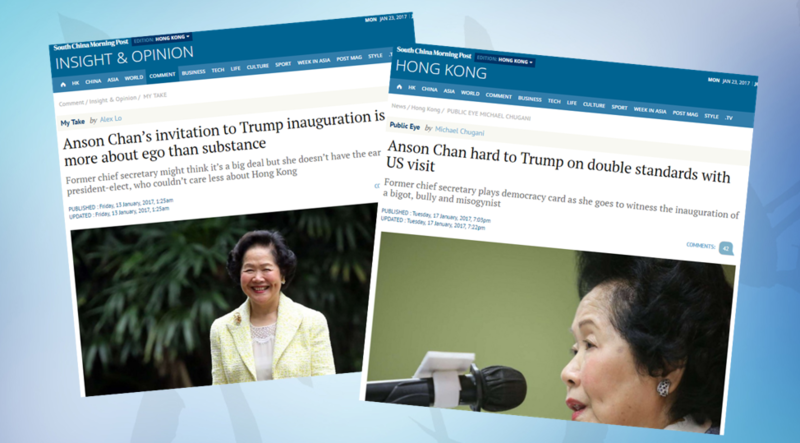 As if Lo’s column was not enough of a hatchet job, less than a week later another of the newspaper’s columnists, Michael Chugani, launched an even more one-sided and churlish attack on Chan, denouncing her for the “double standards” he claimed she displayed in making a trip to the US capital to attend the inauguration of a president who is “a bigot, bully and misogynist”—abhorrent qualities that he implied she was endorsing by her very presence. If Chan truly believed in democracy, Chugani unreasonably suggested, then—like some pop stars and opportunistic US Democrats using the event to score partisan political points on the very first day of a new administration—she, too, would have boycotted Trump’s inauguration. Not only was Chugani’s fusillade mean-spirited, it was also wilfully purblind to Chan’s purpose in going to Washington—which was obviously to say and do all she could to nudge the new Republican administration and congress into putting more pressure on Beijing to live up to the principles stated in the Sino-British Joint Declaration that paved the way for the city’s 1997 handover from British to Chinese rule. 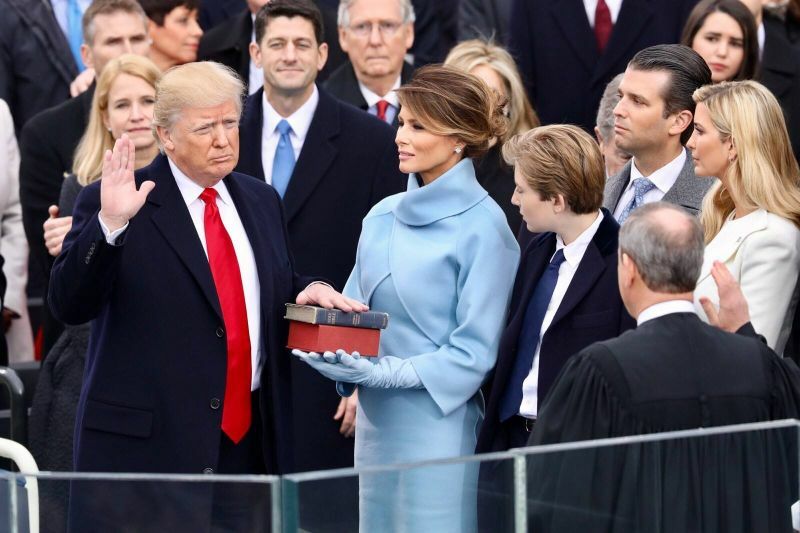 Donald Trump is sworn in as US president. Photo: White House. 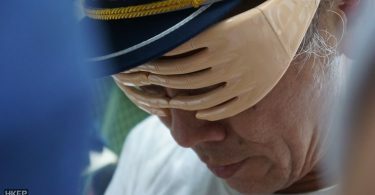 Trump’s personal flaws notwithstanding, he is now the 45th US president and, prior to his inauguration, made it abundantly clear that he thinks Sino-US relations are due for a shakeup, even questioning the one-China policy that the US has maintained toward Taiwan for nearly four decades. To have his ear and/or the ear of his advisers and congressional Republicans for even a moment was surely worth the trip to Washington. Indeed, it would have been foolish of Chan to turn down such an opportunity. This is not the time for Hong Kong democrats to join the anti-Trump parade. Of course, that’s not the way Chan’s Washington sojourn is being portrayed in today’s conscienceless Hong Kong, where democracy is more of a game than a goal and the double-barrelled “one country, two systems” mantra has lately been reduced to single-shot nationalism. The trashing of Anson Chan is just another reminder of this sad truth.